One of the uses of Syncro System converted vans is for the roadside assistance of large trucks. 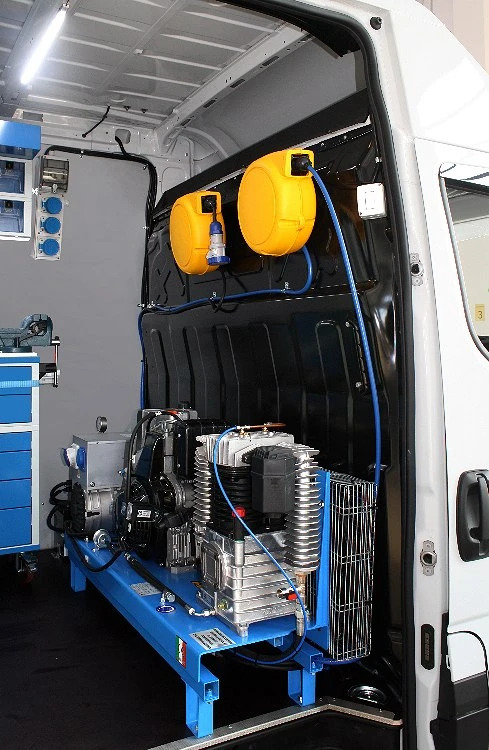 Large commercial vehicles and trucks are subject to breakdowns; an equipped van can repair them on site without having to tow them to a repair shop, which is both time-consuming and costly. Over the years, the Syncro group has equipped lots of vans for roadside truck assistance and knows just what they need to carry out fast and effective repairs on the road. 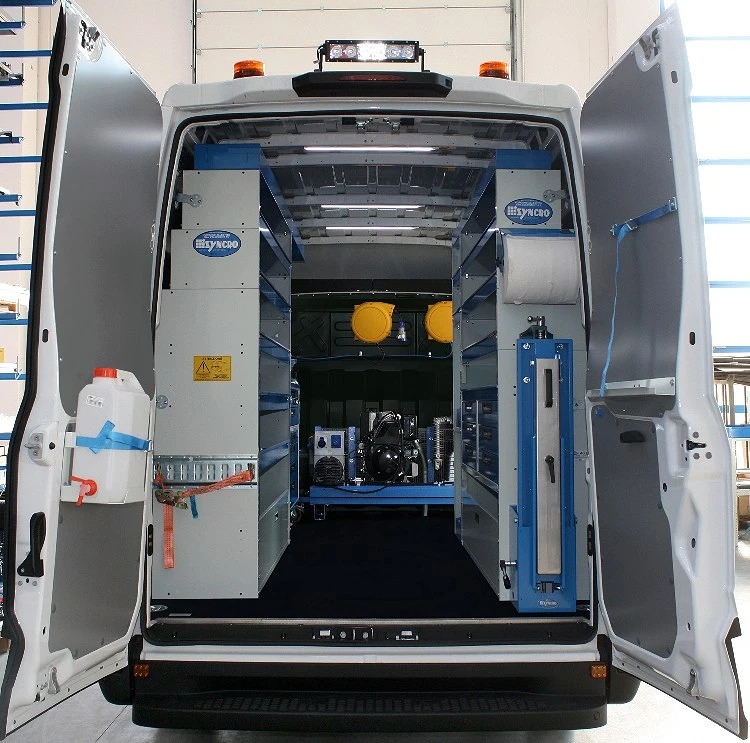 The Daily from the Italian auto manufacturer Iveco is a large panel van with rear-wheel drive that makes it particularly adapted to carry extra heavy loads. 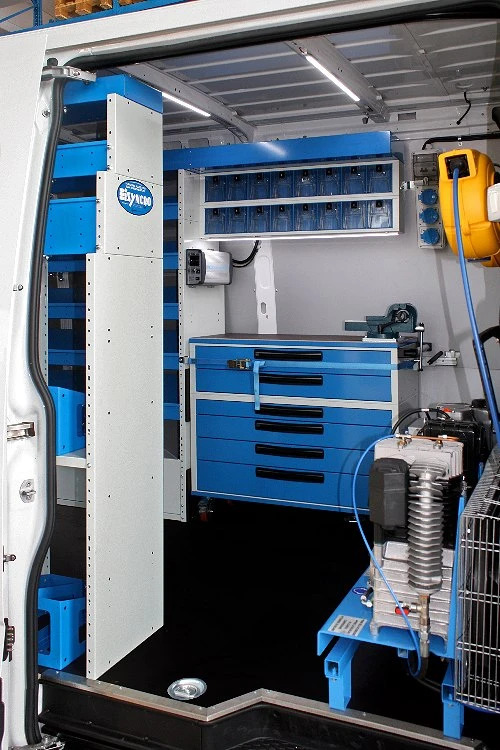 It is often converted into a workshop on wheels – just as the one seen on this page. This Daily conversion was done for an international transport company for repairing trucks when they need servicing and/or repairs on the road or on the lot. 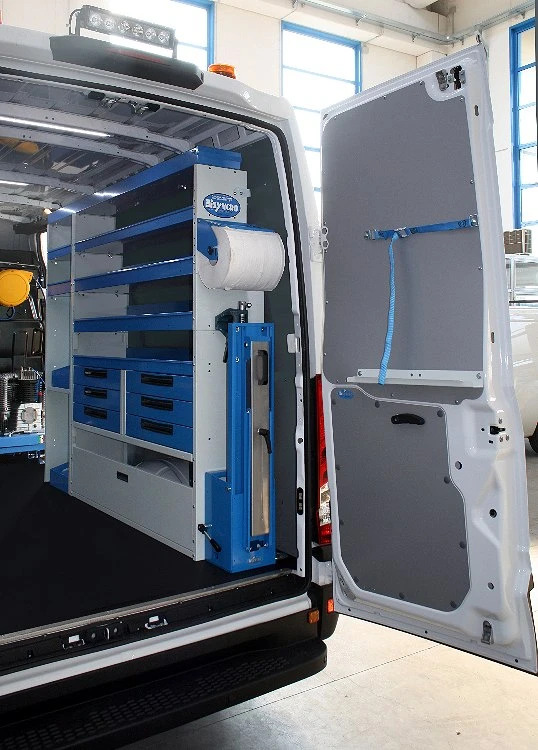 The first step to converting a van into a mobile workshop is protecting the interior surfaces against daily wear and tear, since all vans come with minimal protection. The Syncro team put down a 12 mm resin-coated plywood floor panel, complete with steel borders and recessed steel anchorage points. The wooden floor panel protects the original van floor, creates a perfectly level loading area, and a solid base for mounting the racking components. We lined the walls (including doors) with pre-coated, galvanized steel paneling – that is pre-cut by laser for a seamless fit. The left-hand side racking solution consists of a shelving unit with five shelves, complete with rubber mats and dividers. The wheel arch frame section has a door panel with the Syncro patented open-wide rotational hinge system, allowing for wide-open access to the internal storage space. Toward the bulkhead, we see two metal drawer units with PMMA clear plastic drawers – unbreakable, designed with no protruding parts and individual automatic locking mechanisms. The considerable advantage of clear plastic lies in being able to see all the small parts and fittings even when the drawers are closed. We also positioned a rolling cart. It has six drawers and a 25 mm plywood worktop with a 130 mm vise attached, complete with forged steel pipe jaws and rotating base. The cart is secured for transport by a strap and clasp that are fixed to a shuttle sliding along an aluminum track. The cart can be easily unloaded for work outside the van. 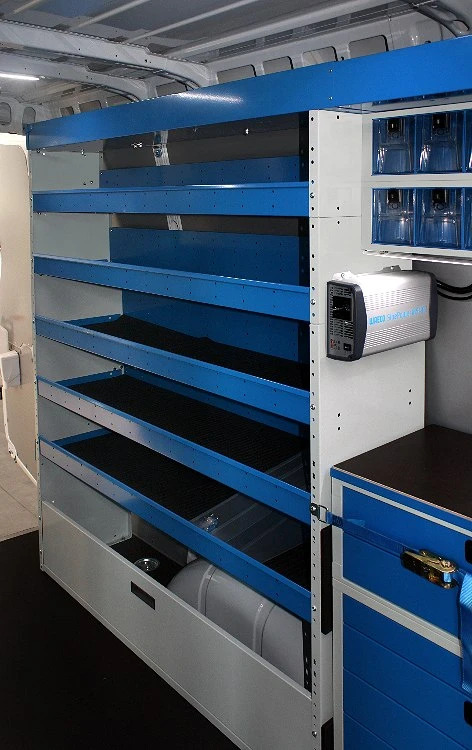 The right-hand racking solution consists of a wheel arch base with wide-open door panel, with two metal drawers units above it, making a total of six drawers, all complete with rubber mats, metal dividers, telescoping ball bearing slides and recessed handles with automatic locking mechanisms. The rest of the right-hand side consists of seven shelves with forward-angled end panels and metal dividers, and a bracket for housing two gas tanks. This Daily's strength lies in its powerful, yet compact and light weight generator / compressor, positioned along the bulkhead. It is capable of delivering 6.2 KBA TO 380 V and 830 liters per minute at 10 bar – producing enough energy to efficiently power this fully functional repair shop on wheels. An electric panel with differential is connected to the generator, providing electric power on board. There is a compressed air tube and extension cord, in order to carry out repair work even at considerable distances from the van. A 900 pure sine wave inverter is connected to the van's battery and supplies safe stable power for computers and other sophisticated electronic equipment. 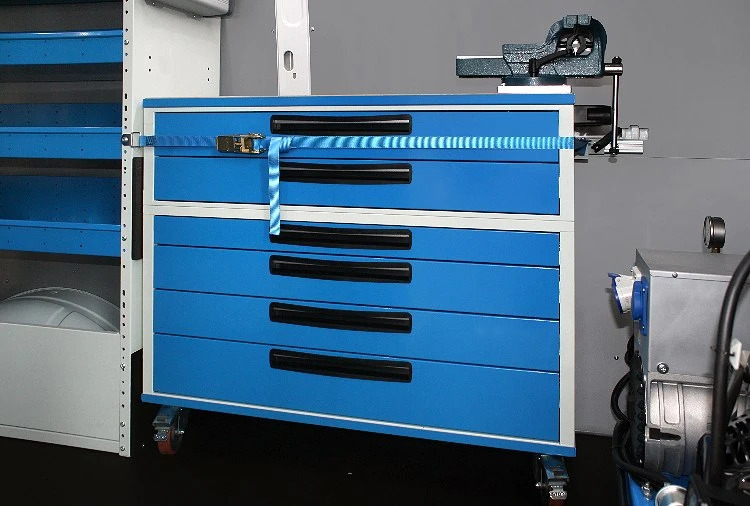 A number of accessories make the mobile workshop even faster and easier. On the rear doors, we mounted the hand-washing kit, complete with water tank, tap, soap dispenser, and 280 mm paper towel roll holder. To be able to work outside the back of the van, a second steel vise is mounted to a pull-down worktop / vise mount that easily locks into both the open and closed positions. A track, strap and clasp that can secure up to 4,000 kilos is mounted on the left-hand side. Another is mounted on the side door. The bright lighting comes from four 15 Watt LED ceiling lights. There are two very powerful LED flood lights to light the area outside the van, and four orange rotating beacons for signaling road-side work. 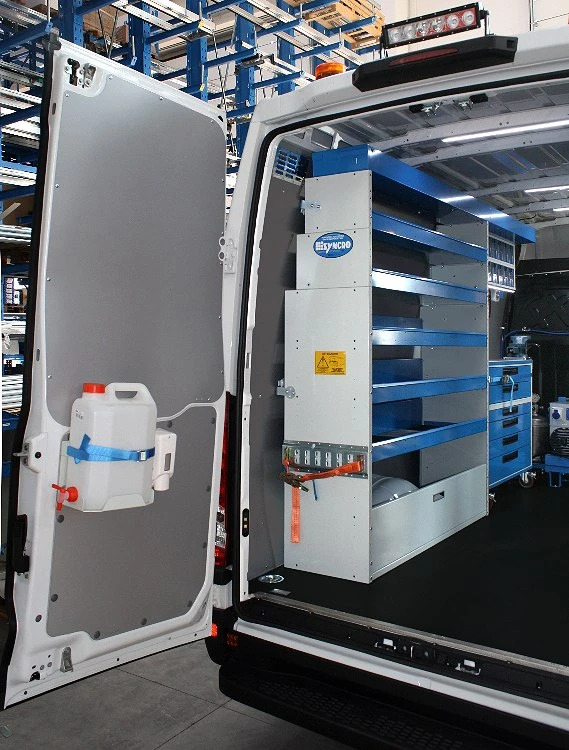 Thanks to this compact but very complete workshop on wheels, the van can carry out quick efficient repairs on the truck fleet – both on the road and at the company's base of operations. Another bulls-eye for the Syncro System team!